Bender (formally Washington) and our close friend’s dog Leia. They have become very close pals over the last few months. Leia can hardly contain herself when Bender visits and follows him around everywhere he goes. He doesn’t seem to mind and loves playing with her. 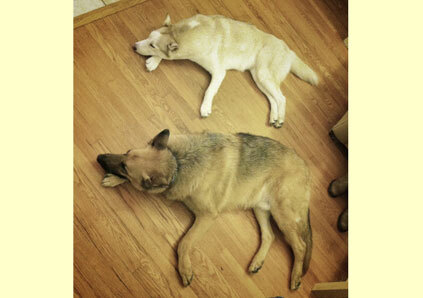 This is them after Thanksgiving dinner…’synchronized napping. I thought it was so cute, I had to share!